FILE - A female U.S. Marine touches the grave of a friend at Arlington National Cemetery in Virginia. The Veterans Day holiday dates back to 1919. He hosted a breakfast Wednesday for veterans and their families at the White House, and later laid a wreath at the Tomb of the Unknowns in Arlington National Cemetery. He is making remarks about the significance of the day and those it honors. In Europe, church bells tolled and officials laid wreaths to commemorate the millions of soldiers killed in World War I. Ceremonies in Paris and London and many smaller cities across Europe marked the "eleventh hour of the eleventh day of the eleventh month," when the armistice was signed on November 11, 1918. It ended what at the time was called "the war to end all wars." 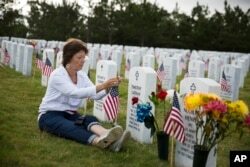 Vickie Hunt sits next to the grave of her late husband, Vietnam veteran Cpl. Timothy Hunt, at Georgia National Cemetery on Memorial Day, Monday, May 25, 2015, in Canton, Ga. Restaurants and other retailers across the United States are offering free or discounted items and service to the nation's military veterans Wednesday in honor of the annual Veterans Day holiday. The special tokens of appreciation are taking place alongside more traditional and somber observances. The Veterans Day holiday, which pays tribute to all men and women who have served in the U.S. military, dates back to 1919, when President Woodrow Wilson proclaimed November 11 as Armistice Day to celebrate the end of fighting exactly one year earlier in World War One between Germany and the allied nations of Britain, France and the United States. Armistice Day became an official U.S. holiday in 1938, and remained so until 1954, when it was renamed Veterans Day in the aftermath of both World War II and the Korean War. It is separate from Memorial Day, which is observed on the last Monday in May and honors servicemen and women killed in war. The U.S. Veterans Day holiday also coincides with other World War I-era holidays around the world, including Remembrance Day in Britain and the Commonwealth nations of Australia and Canada.